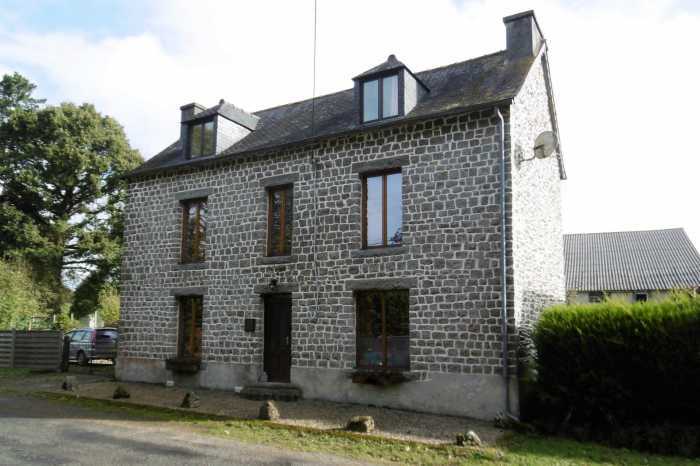 Properties for sale in Brittany, France - AHIB-1-PO-076 Poullaouen 29246 Beautiful stone property completely renovated offering 4/5 bedrooms. AHIB-1-PO-076 Poullaouen 29246 Beautiful stone property completely renovated offering 4/5 bedrooms. Large living-dining room open concept, double exposure with stone fireplace and wood stove. A modern kitchen with a hob and oven. A beautiful wooden staircase leads you to the 1st floor which offers 2 double rooms and 1 single room. Shower room with washbasin and WC. Separate toilet, linen closet. Another wooden staircase leads to a very large open room with shower room and WC. This nice room could serve as additional living room. Another double bedroom adjoins this room. This property would make an ideal family home with generous housing and benefits from a complete renovation. There is no work to do. Central gas heating and large outdoor parking, a garden shed / summer house and a fully enclosed / secure garden. The local village with a small shop, several bars and a restaurant are just minutes away. The popular town of Carhaix offers all the amenities and can be reached in about 10 minutes by car. Double glazing, Fireplace, Internet, Outdoor lighting.